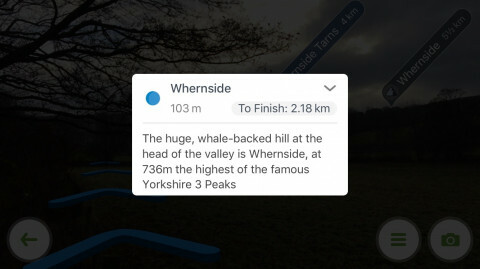 If you’ve downloaded the latest ViewRanger update on Apple or Android, hopefully you’ll already be familiar with Skyline – our exciting new augmented reality feature. 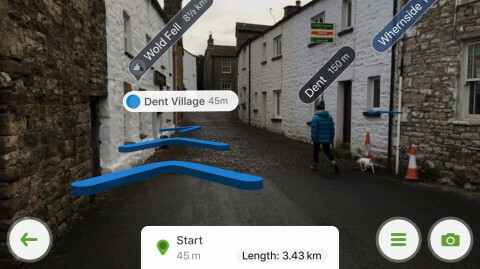 Skyline uses your phone’s camera to identify and label landscape features within 20 miles of your location, including peaks, lakes, towns, ridgelines and even glaciers, but did you know it can also be used to navigate? 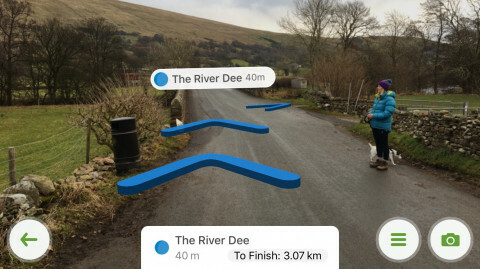 When following a pre-planned route in the ViewRanger app – you can plot your own or choose from one of over 100,000 routes already on the app – when you open Skyline a series of blue navigational arrows will appear on screen, showing you which way to travel. 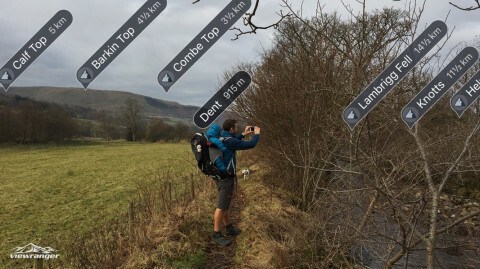 And if the route you’re following contains facts and photographs attached to specific waypoints, they will pop up in the relevant location to provide you with a digital narrative within the landscape. Starting on the cobbles of Dent (surely one of England’s most outrageously picturesque villages! ), Skyline’s navigational arrows led us through the village’s windy streets, while also pointing out the names of the local peaks. A few hundred metres outside the village, my phone buzzed in my pocket to alert us we were approaching a key point on the route. 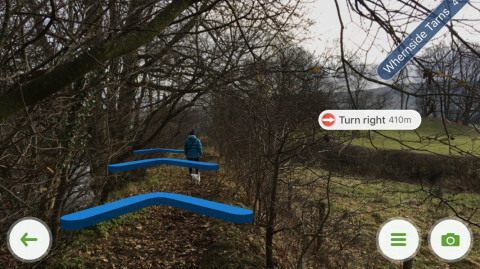 When I opened up Skyline, it prompted us to turn right along the River Dee and join the Dales Way footpath. As we followed the river this window popped open, letting us know we were heading towards Whernside – the highest point of Yorkshire’s iconic Three Peaks walk. 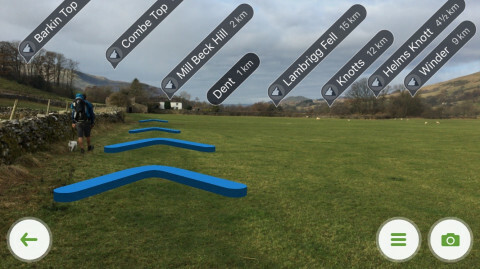 While navigating with the directional arrows you still get access to all of Skyline’s other features, with surrounding peaks and villages clearly labelled. 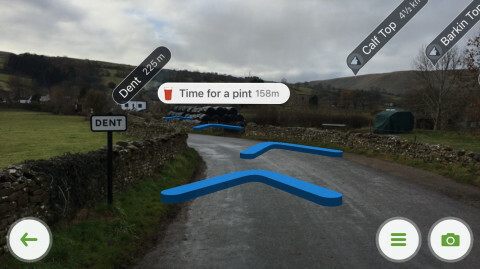 As well as adding text, images and even audio clips to waypoints, you can also select icons that will alert you when you’re approaching an important point on your walk. Entering this field a signpost warned us to stay close to the wall to keep away from grazing sheep, which was perfectly replicated by the Skyline arrows that kept us on the official line of the footpath. Back in Dent with Skyline pointing the way to the George and Dragon pub, where the beer tastes good and the home-cooked food smells even better! For more information on following routes with Skyline, click here.